Elaborate and detailed illustrations dominate this story of a grumpy girl named Ivy and the lonely little raincloud who befriends her. 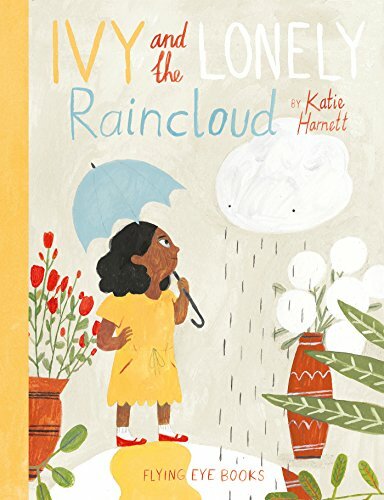 Ivy and the Lonely Raincloud presents a unique look at a friendship blossomed from an unlikely source. Raincloud, upon finding himself abandoned because the sun has scared off his fellow cloud-mates, is crazy desperate to find someone to be with. His rainy constitution is neither appreciated nor well received by his many advances. He offers companionship to a dog, a ball, a statue, a rooftop, a window, even a bride fresh from the altar of her wedding day. Then he notices Ivy, who carries an angry expression and a frumpy, defiant posture. Raincloud interprets Ivy's mood as evidence of loneliness. Following Ivy along her route through town, on the metro and into her home (which incidentally is a flower shop), Raincloud does not shy away. Yet Ivy does not seem thrilled by Raincloud’s presence. She even barks at him through a speech bubble to, “LEAVE ME ALONE!” Undaunted by her rudeness, Raincloud again assumes Ivy is lonely, and he pursues Ivy to the interior of her florist shop. Ivy continues on her grumpy rampage with every chore she tackles. No care does she give to the watering of the plants or the arrangement of flowers which, having inherited their disposition by virtue of proximity, look wilted and dejected, too. Raincloud’s solution to getting on Ivy’s good side is to pour rain onto the flower shop plants all night long. When Ivy wakes in the morning, all the greenery looks perky and fresh, Raincloud gets a hug, and the flower business booms happily ever after. Story wise, there are several items that could have been enhanced. While there is a solid understanding for why Raincloud is alone, there is zero evidence to support Ivy’s attitude beside Raincloud telling us that of course she must be lonely. Raincloud latches onto Ivy for no other reason than he is just tired of looking around for friendship possibilities. Ivy rejects him as surely as the bride outside the church does. But in Ivy’s case, Raincloud pays no mind, pursuing Ivy even though she clearly is not interested. A mixed message as to what friendship truly is could be read between the lines. Ivy’s feelings for Raincloud change only after seeing what Raincloud can do for her. Ivy likes Raincloud because Raincloud can water her plants. How does this service lend itself to deep, meaningful, fulfilling, lasting friendship? However, the big psychological questions hidden in this book are most likely unintentional and the reader will most likely presume Raincloud is just looking for a way to be accepted and useful. Harnett enlivens the scene with a variety of well-constructed illustrations that are action oriented and energetic. There is depth of expression and creative perspective. Great attention is paid to patterns, details and the subtle inclusion of other children, animals and toys. Particularly important is the aerial view from further above Raincloud looking down on a quaint pedestrian street. This snapshot serves to solidify the story as coming primarily from Raincloud’s point of view. Another nicely done feature is the way in which Harnett incorporates diversity. While Ivy has a dark complexion, other people in the town are clearly from a variety of ethnicities. Such diversity will serve to make Ivy and the Lonely Raincloud appeal to children from all walks of life.